Departing a bit late, resulting in spoiled initial plan of having breakfast/lunch/teatime along the old trunk road from Ipoh-Tapah. 😉 Team? Me and KYT only. Chose the highway instead, and travelling was a chore as it was a very, very hot day. Pathetic & empty looking arrangement huh? They served economy rice,with plentiful of dishes, including ulam (raw vegetables) and grilled fish, as well as various masakan kampung. We chose to eat freshly cooked dishes, as from the menu on the wall, there were at least 10 types of Nasi Goreng and the likes, available for order. 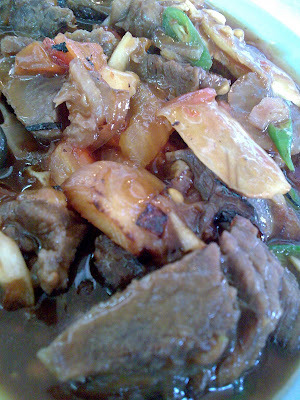 Skoon had some scares as the waiter/waitress kept serving the aforementioned beef dishes and claimed those were Nasi Paprik, when what Skoon ordered was in fact a CHICKEN dish. 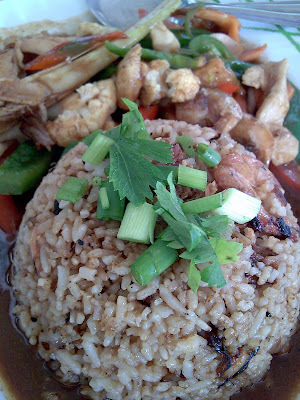 Luckily hers arrived just the way she wanted, Fried Rice with Ayam Paprik (Chicken, Prawns and Vegetables in spicy/sour sauce). Tried a piece, and the dish was tasty. The price was pretty reasonable for the portion served, but be prepared for some wait in case you decide to order from the kitchen. The place was designed ‘half al fresco’, therefore brave the heat if you’re seated on the outer ends. Location : Coming from the North-South Highway, towards Tapah town, you will pass by a bridge (Jambatan Batang Padang if I’m not mistaken), after turning left at the traffic lights at Shell petrol station. This shop/stall is located on the left, immediately after the bridge, beside the mosque. 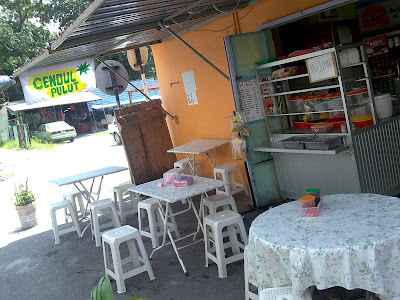 Location : Cendol Pulut @ a side lane beside Hotel Utara on Jalan Stesen. 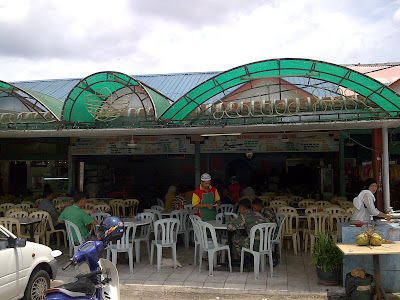 To get to Jalan Stesen, drive further down the road after the bridge, and you will reach a traffic lights with a shop named Restoran Kai Fan on your right. Turn right into Jalan Stesen, and once you see Klinik Sentosa on your left, and Hotel Utara on your right, turn right into the small lane beside the hotel. The stall is situated at the lane itself. I love nasi goreng paprik!!! 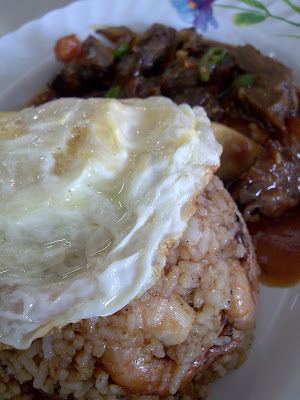 The prawn in your place of Nasi Goreng USA looked so big la…Where got ppl put such a big prawn in the fried rice de…Haha! you guys can certainly eat Malay food ! sc : yeah! mango pulut rice in thai? my absolute fav thai food! 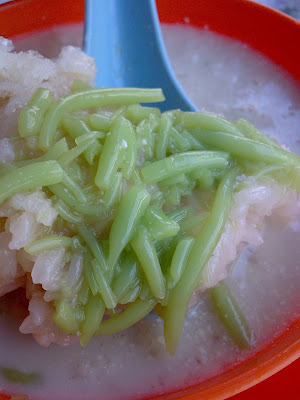 What a coincident…someone blogged about cendol and i just commented that I love mine with pulut and there you go, you blogged about it too. Yes…they do have pulut version in KL but a rare find these days. And sometimes you need to ask as they are hidden in a container..wonder why. Eee I don’t like cendol with pulut. Too ‘jelak'(filling? ).